Yes, we know it’s summer, but it’s never too early to prepare for the fall recruiting season! If you’re a first-year, you’ll be inundated with employers coming to campus, posting jobs, and rapid interview schedules. If you’re a second-year, you’ll likely either accept an offer at the end of your internship (lucky you) or face the battle of re-recruiting. So, we took a look at our data to track timing for MBA job offers across the top industries, both for full-time roles and internships. As always, our data comes from thousands of MBAs across the country, all checked and verified to make sure you get the info you’re looking for. Consulting – still the most popular of MBA careers, despite the tech sector’s recent surge – typically adheres to a fixed schedule. Firms recruit largely on-campus, with some firms like Clareo Consulting Group (which seeks entrepreneurial candidates for their innovation consulting practice) and Huron Consulting (which takes a special interest in candidates with life sciences backgrounds) taking a specialized approach, and others (especially MBB) simply seeking “best athletes” that perform well on the case interviews. Intern hiring starts in January, but don’t be fooled into complacency – you should be networking and prepping for brutal case interviews well before the new year in this competitive field. Full-time offers center around the end of the summer internship in August, and the peak of re-recruiting in October and November. Bottom line: if you’re a rising second year MBA in a non-consulting internship, but want to break in – better start case prepping over the summer. What’s the most common mistake we see MBAs looking to break into tech make? Oddly, it’s recruiting for another industry (*cough* consulting *cough*) with a similar timeline. Think about this for a second: the earliest Big Tech offers will come in February (and that’s still generous for some like Google, which hires on a rolling basis throughout the spring). You’ll be double-dipping during December and January with case prep, networking, interviews and more – for two industries. If you’re lucky or talented, (or both) you’ll get some tech offers and some consulting offers around the same time in February – that’s some pretty attractive optionality. But chances are you’ll get a consulting offer before you even finish your tech recruiting, and you’ll probably pick consulting (…because, one in the hand is worth two in the bush, as they say). 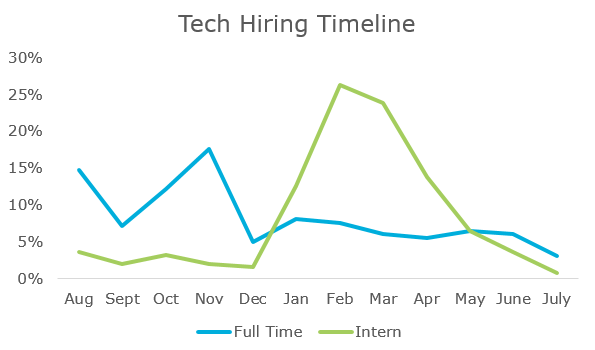 The major variable in tech hiring is company size: smaller tech firms have a history of hiring MBA interns as late as May or June. 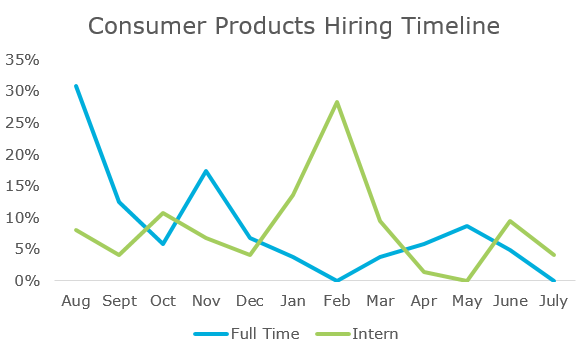 Larger firms that engage in on-campus recruiting (Microsoft, IBM, Oracle, Amazon) have more set timelines, with high-performing interns receiving offers in August and 2Y re-recruiters finishing up around November. Recruiting for financial services (in non-banking roles) puts you on par timeline-wise with consulting and the earlier consumer products companies. As a first-year, you’ll spend November and December networking, applying, and interviewing, with most offers coming in around January or February. Smaller players also do some hiring in March and April, so if you don’t land with one of the big companies, don’t panic yet. 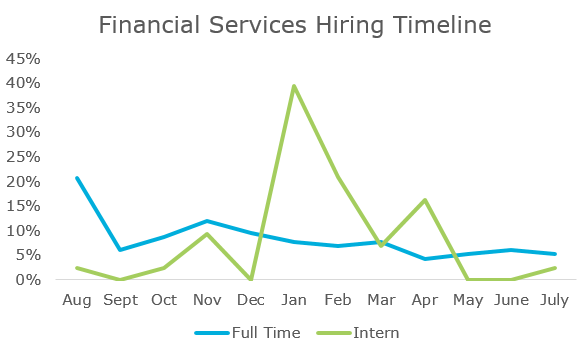 For full-time roles, there’s a huge trend towards extending offers to interns, but not much predictability beyond that – financial services companies hire year-round. So, it’s probably best to spend the time focusing on the companies that you like best, and finding out their specific timelines by visiting their company page on TransparentCareer and clicking your desired position – we’ll show you a visual offer timeline of every position within the firm. Investment banking, as one of the most venerable and coveted post-MBA careers, also happens to be one of the most standardized in its recruiting structure. It’s simple really – as a first-year, you decide ASAP that you want to head into banking. Then you spend October, November and December networking (a lot…bring those suits! ), interviewing, and wining/dining. By January you’ll have an offer, a few (if you’re lucky), or you’ll come up empty-handed – in which case you’ll still have plenty of time to recruit for other industries. 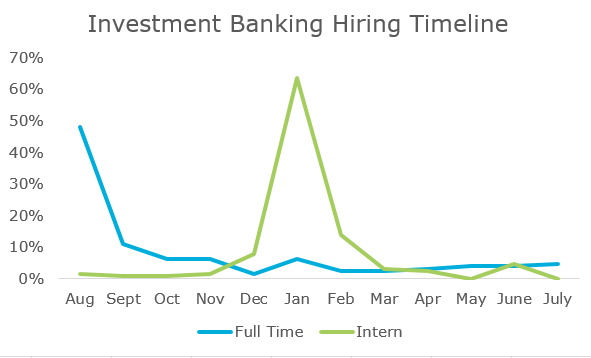 Banks tend to hire their interns, so you’ve got a great shot of landing a full-time gig as long as you perform. Beyond that, there’s really not much re-recruiting in IB – less than 10% of full-time offers come in October and November. Companies hiring MBAs into the CPG (consumer packaged goods) industry typically adhere to on-campus recruiting timelines, similar to consulting or banking. 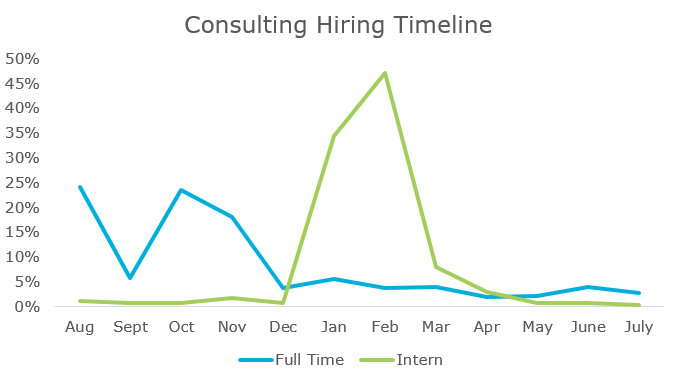 The major difference here is the variability of the timing – while the overwhelming majority of consulting offers come in within a month of one another, CPG internship offers can happen as early as October or as late as June. The major players (Procter & Gamble, Pepsico, Kraft-Heinz, MillerCoors) extend internship offers in midwinter. It’s clear that CPG companies prefer a strategy of hiring their interns back for full-time roles. Indeed, some hiring managers have told TransparentCareer that they prefer to bring back 100% of interns and not step foot on campus for full-time roles. That said, there is a generous spike of offers in November, typically a result of companies addressing roles left unfilled due to interns turning down full-time offers. If you’re looking for more career related data, sign up for a free TransparentCareer account. 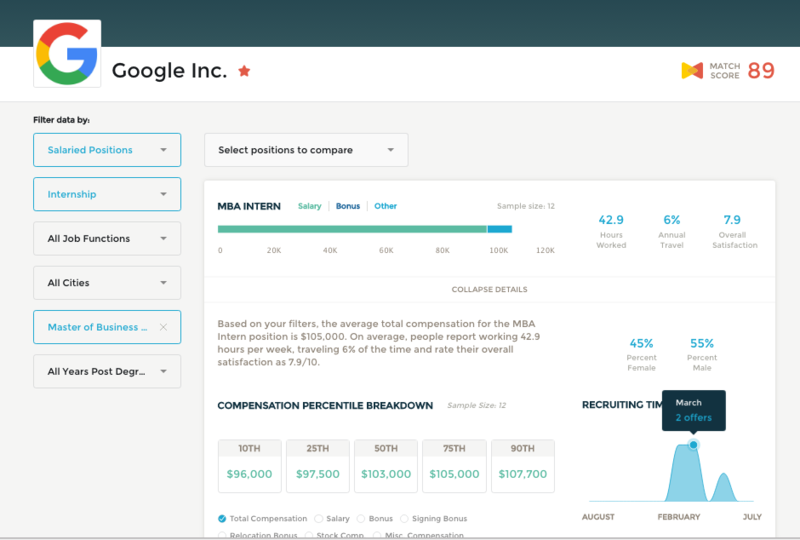 We have data on compensation, work/life balance, and more, all from top companies from users like you. Did we mention that it’s free? Sign up here.